Eric Hands doesn't come across as a great artist or a seasoned pro of the photography world. A quietly spoken, friendly and unassuming man welcomes us to his exhibition within the unlikely surroundings of South Croydon's very own monument to British Rail. Unlikely maybe, but appropriate yes. You see, an extensive part of Eric's recent work includes a series of pictures taken whilst riding the train around the rail network in a zone ranging from Waterloo and Blackfriars down to the South Coast. Taken in an unforgivingly stark and uncompromising manner, the views capture the forlorn and decaying legacy of British Rail, and yet can often be surprisingly beautiful. Anti-personnel spikes atop a wall at Selhurst Station have been transported completely out of both context and scale, and transformed into a Gothic structure thrusting into an azure blue sky. Who's watching who? 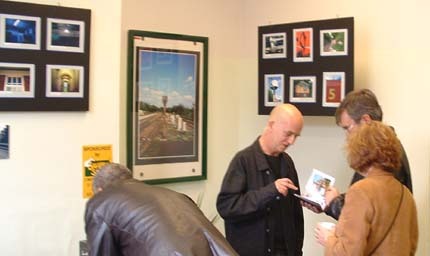 Looking at Railtrack photos whilst a Railtrack CCTV camera looks back at the audience. The layman can learn a lot here. Normally the preserve of experts and gurus of the snapshot medium, words like contrast, shadow, and use of colour spring out at you. One frame concentrates solely on the shadow of modern back-to-back metallic station benches. The effect is so dramatic that the eye convinces the mind that the shadow contains colour. Stepping back in time for a moment, Eric was a staff member at the infamous Private Eye magazine, and the pictures from this era stir the inevitable nostalgic emotions that the like of Pete Cook, Richard Ingrams et al still command. The views of life and staff at the magazine in the early seventies retain their freshness to the extent that they were featured in 'Amateur Photographer' magazine just this March. 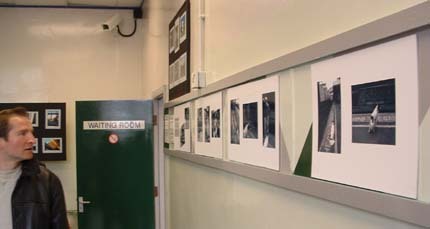 Other recent displays have included the Croydon and Wandsworth borough annual photographic competitions where Eric's work was short-listed and selected for exhibition. Without falling down on technical aspects, (many of these pictures are produced on a shoe-string budget), the real essence of Eric's photography is his ability to freeze frame his unique and very personal take on life. 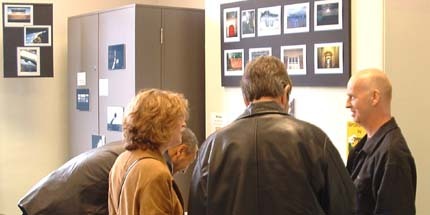 Eric (pictured right) chatting to visitors to his exhibition. Journeying to Romania in the late nineties his sessions with Cardiff Dance Charity Rubicon portrays scenes of deaf and disabled orphans absolutely entranced with the performances being put on for them. What goes around comes around and an entirely new and geographically removed audience are entranced with the photographs that Eric produced. The joy and the warmth, and maybe just sometimes the backdrop of sorrow and inspired anger, reaches across the tableau to pull joyously and worryingly at your thoughts and all too comfortable emotions. Croyweb shows what can go wrong when you don't use fill-in flash. There are assorted views of London taken last year, Eric-style peeks at Catalonia and snaps of seventies people from the album. The sheer adaptability and cross-genre ability of the photography surely places the title of his exhibition, 'Down The Line' under strain - it's too big for that. And what for the future? Croydon Clocktower is now taking an interest and the upcoming gallery and exhibition space there will be giving Eric more than a passing mention. And this great media, the web? Eric's new web site www.erichands.com is a gallery in itself. Unusually for a photographic web site the quality and resolution are not deliberately depressed to ensure copyright. Eric is rightly proud of his work and wants the world to see it. Also unusual is the lack of text - "I feel a photographic web site should be simple, no flashy graphics, just a simple layout showing the pictures. The pictures are what matter". Eric explains why it's important not to rip pages out of the photo albums. We were at Eric's exhibition at South Croydon Station for about half an hour, but couldn't help wondering what could actually be achieved if this Croydon artist had some funding and was more actively sponsored with his visually commanding and enlightening perspective on South London life. Keep an eye out for his upcoming displays on his web site www.erichands.com and get ready in anticipation for what's "Down The Line". It's going to be good.